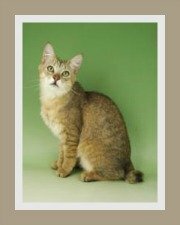 The Chausie cat is a hybrid cat breed created by man. We have heard people refer to it as a Jungle cat hybrid. Domestication of the wild Jungle cat started centuries ago. It is believed that the Ancient Egyptians welcomed the wild Jungle Cat into their homes. Over time, these wild cats with their even temperaments and dashing good looks became domesticated and revered by the Pharaohs. The Jungle cat, with the Latin name of Felis Chaus, is believed to have mated with domestic cats and so the first hybrid domestic cats were established some 3000 years ago! Whilst none of this can be confirmed, statues, mummies and murals found in Egyptian tombs and Pyramids depicts a cat that strongly resembles the Felis Chaus. We have read that they were originally known as Nile cats or Stone Cougars, but we cannot confirm this. 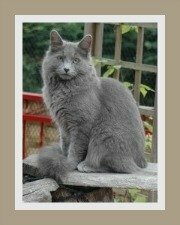 In the late 60's to early 70's breeders developed hybrids by crossing the Jungle Cat with various domestic cats. The objective of these early breeding programs was to produce a hybrid cat breed that would satisfy the needs of people desiring a wild cat. This it seemed was a healthy alternative to keeping a wild cat as a pet. (The California Spangled, was also developed in the 70's, but has now largely disappeared. 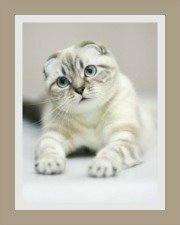 It too was developed with the same objective in mind, but using only domestic cats in the breeding program). 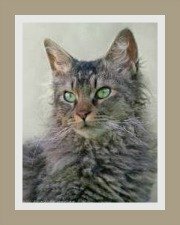 In the 1990's this breeding program was resurrected adopting new and advanced expertise....and so the Chausie cat was born. The name 'Chausie' that these hybrid cats carry today was derived from its wild ancestor, Felis Chaus. Today only the Abyssinian and domestic shorthair is allowed for outcrossing. 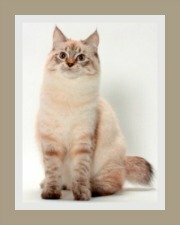 The International Cat Association (TICA) afforded the Chausie foundation registry status in 1995 and moved to Advanced New Breed (ANB) status in 2003. 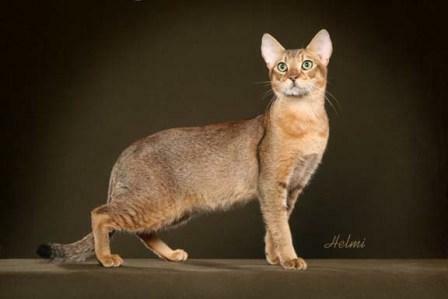 The Chausie was awarded Championship status by TICA in May 2013. The CFA (Cat Fanciers Association) and GCCF (Governing Council of the Cat Fancy) do not, at this stage recognize the Chausie - but things change and we will keep you posted. 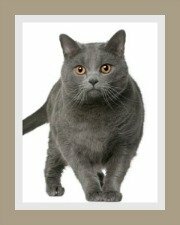 As the Chausie cat is a wild hybrid cat breed certain States in the USA do impose restrictions on keeping cats of wild origin especially first generation crosses. To avoid disappointment, we recommend that potential owners search the Hybrid Law (USA) web site for additional information. Also check your local county regulations and homeowners' rules to determine what ordinances apply in your area. These regulations will affect all hybrid cats. This includes Savannah cats (cross Serval), Bengal cat (cross Asian Leopard) and Safari cat (Geoffroy's).